Among the many talented visionary artists of the global spiritual counterculture, one name rises to the top of nearly every list: Alex Grey. He and his wife Allyson Grey (who is also a painter) relentlessly travel the world, headlining large-scale festivals, consciousness parties and packed gallery shows. At their most recent appearance in Sao Paulo, Brazil, they painted before an audience of 25,000. Quite famously, the two of them (together for more than 37 years) are more adamant than Johnny Cash about wearing only black in public and private. Jonathan Talat Phillips: When did you start making visionary art? 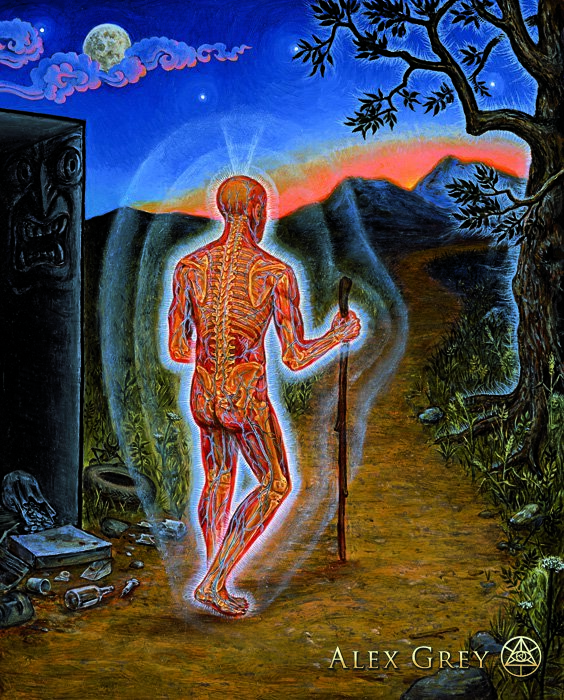 Alex Grey: My art has always been in response to visions. Rather than confine my subject to representations of the outer worlds, I include portrayals of the multi-dimensional imaginal realms that pull us toward consciousness evolution. That is the nature of all sacred art. The arts are the perfect medium for transmissions from inner domains. 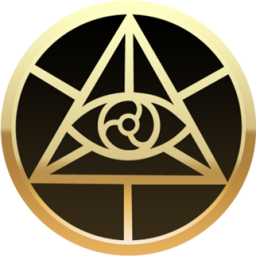 My entheogenic visionary experiences felt universal so I looked for a way of portraying these directly. My X-ray figures reinforce a sense of human unity and the mystical experiences they undergo hold a sacred mirror to the psyche. Jonathan: Who are your influences? Alex: Allyson Grey. We've shared a studio for 37 years and never run out of things to discuss. Decisions are made in a community of two. My father was a professional artist all his life who encouraged my path as an artist. Spiritual teachers and artists that have opened the eye of wisdom for the world, and visionary community builders have influenced my work. Jonathan: You and your wife are known for your long-term creative partnership. What's your collaboration like and do you have any secrets for maintaining a marriage amid the storms of the artistic process? Alex: The secret to our success is constant communication. Allyson is reading these questions, typing and editing the words that you are reading while I am painting. Our consciousness is fused into a "Third Mind." The process of our creation is an interwoven partnership with discussion and negotiation as the glue. A relationship succeeds when obstacles are met with communication and resolution. A relationship flourishes when we take the beloved as our teacher. Shared goals create a transformative interwoven path. Allyson and I chose each other 37 years ago. Then we stopped choosing and continued traveling one road in partnership. Jonathan: How have entheogenic substances influenced your work? Alex: I was a teenage nihilist on the verge of suicide when I asked a God I did not believe in to show me a sign. Within 24 hours I had taken my first LSD trip, seen the unity and luminosity of all things and met the love of my life, a goddess manifest, Allyson, my constant partner and companion. Journeying together we experienced a vision that further changed our life and work. Dissolving into light, we saw that every being and thing was interconnected, an infinite grid of fountains and drains of love energy. This changed our work in pursuit of depicting the unveiling of reality. Our artwork flourished in service to the divine. The Sacred Mirrors series and the Progress of the Soul series were born of this experience of life energy. Jonathan: What about your Buddhist practice? 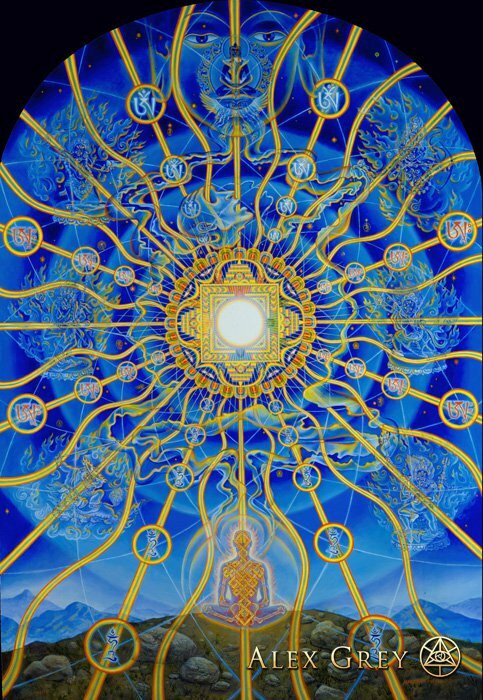 Alex: Buddhist practice might have remained outside of my field of vision had it not been for a spiritual opening through entheogens (God-inducing substances). Many who have experienced altered states realize that those visions catalyzed their spiritual growth. A fully engaged imagination is essential to the spiritual practice of the Tibetan Buddhist Vajrayana School whose artistic tradition is in service of consciousness transformation. Liberation Through Seeing is a term ascribed to a class of artifacts in the Tibetan Buddhist tradition, objects that plant a seed of liberation in the mindstream of the viewer. To manifest an object with the power of Liberation Through Seeing is the highest aspiration for a creator of sacred art. An object with that power can be a catalyst for consciousness evolution and, according to Tibetan Buddhist teaching, can affect the karmic future of all sentient beings. The visionary imagination is the source of art and religion. Jonathan: Is there friction between Buddhism and psychedelic exploration? Buddhist teachers sometimes warn against intoxication. Alex: Classic entheogens like psylocybin, mescaline, LSD, DMT are neither toxic nor physically addictive. But because of their power, some people should avoid these substances. The convergence of psychedelics and Buddhism is the subject of the book "Zig Zag Zen," for which Alan Badiner and I selected teachers and artists who fuse the path of Buddhism and the sacramental use of entheogens. Trungpa called psychedelic experience super-samsara because of the temptation to get caught up in one's own visions. When asked if he thought drugs could catalyze spiritual experiences, the Dalai Lama replied "I hope so." Published scientific findings prove that over 65 percent of spiritually inclined individuals have a spontaneous mystical experience from a single dose of psilocybin. Many glimpse spiritual reality through a psychedelic lens, then seek meditation to ground their insights in daily practices. Jonathan: Why do you think your work is resonating so much with the current transformational movement? Where do you see the culture headed? 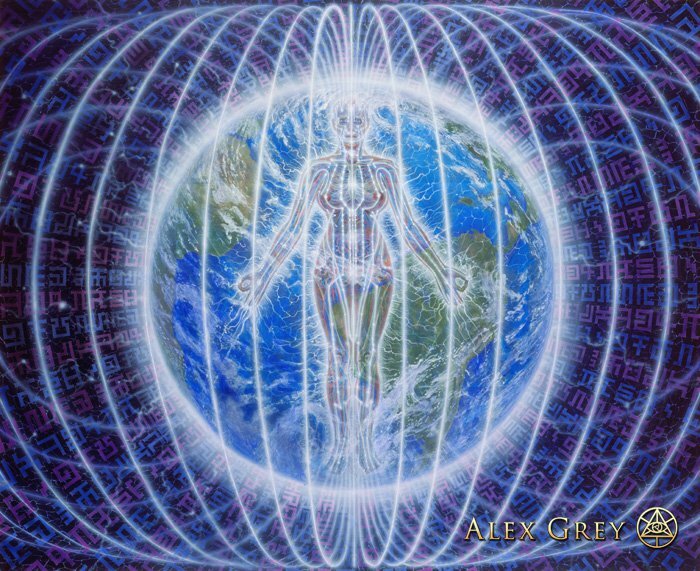 Alex: The evolutionary agenda must include a vision of our light body and our higher connections with spiritual reality. The juice in the new cultural movement is the integration of mysticism with social action. Mystic states reveal our unity with all beings and things and transcend conventional time and space. The web of life, love, suffering and death unites all beings. A sympathetic embrace of the nature-field and visions of the beyond within awaken us to our part in the continuum. This realization makes social justice our responsibility -- informed and empowered by personal revelation and humanity's wisdom traditions. Jonathan: You've worked with a number of famous musicians, from Nirvana to Tool to Thievery Corporation, even doing live-painting during shows. How does your visual work intersect with the audio arts? Alex: It has been an honor to paint on stage and have my art grace the albums and stage sets of renowned musicians. Peak experiences on stage with musical favorites including Shpongle, Tipper, Ott, Beats Antique, Disco Biscuits, STS9, SCI, Ken Jordan. ... In dozens of cities all over the world, the Love Tribe gathers to share wisdom, art, dance, performance and music. Our association with this creative web of light offers an opportunity to serve a great community. 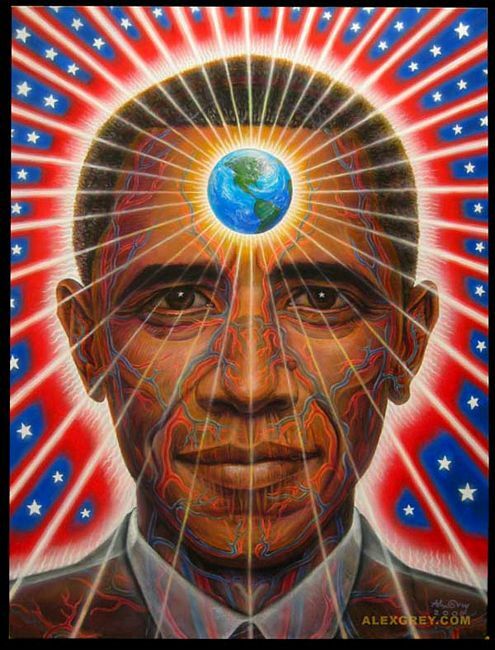 Jonathan: During Obama-fever in the last election, you created a portrait of the president, featuring a glowing, hopeful earth in the center of his third eye. How do you feel about that painting more than three years later? Alex: Obama was the better candidate. It was a historic and important victory. The world embraced the election as a triumph over America's shadow. Some grass roots efforts proved that a difference could be made. The light of truth seems alive today in the Occupy movement, a positive sign that our collective conscience is engaged. Jonathan: What are you working on now? Alex: At this moment, a team of CoSMonauts occupy our studio photographing the last pieces for my upcoming book, "Net of Being' This is third in a series of large-format monographs published by Inner Traditions, starting with "Sacred Mirrors" in 1990 followed by "Transfigurations" in 2001. "Net of Being" covers the most recent decade of my paintings, sculpture and social sculpture (CoSM), and it's integration into the cultural body. Jonathan: Do you own any article of clothing that is not black? Just curious. Alex: I wear black as a sign of mourning for the web of life and because of it's resonance with the transcendental void that precedes all creation. At Burning Man, Allyson and I wear apparel printed with my art. (Burning Man 2012, wearing colors at Area 51, Fractal Nation and Palenque Norte.) Otherwise, no, just black.